On 8 January 2003, news of the so-called ‘ricin terror plot’ broke in the British media. Police had raided a flat in north London (dubbed ‘the factory of death’) and disrupted an Al-Qaeda cell, which had been making explosives, along with ricin and other lethal toxins, it was reported. The headlines could hardly have been more alarming or more unequivocal: ‘Ricin near Bin pal’s home,’ warned one tabloid. 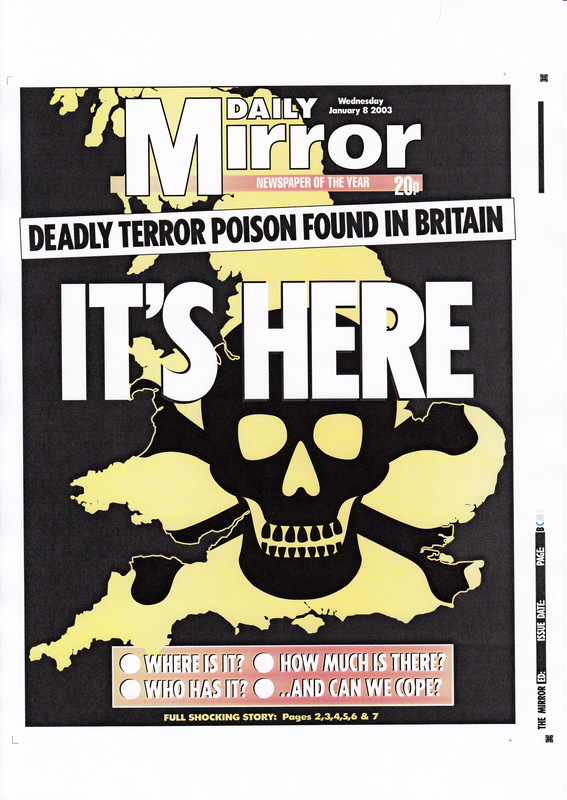 The front page of another newspaper showed a skull and crossbones superimposed on a map of Britain, with the stark words: ‘IT’S HERE.’ The Health Secretary and Home Secretary issued a joint public statement about the find and the NHS warned the public not to panic. Not everyone took the NHS advice, as the BBC reported that gasmask sales had ‘soared’. The manager of an army surplus shop was quoted as saying: ‘My niece lives in London and she and her husband took gasmasks down there. People are worried about the tube.’ What the media did not know was that they had been fed entirely wrong information: there was no ricin ‘here’ at all. When government scientists had entered the Wood Green flat soon after the raid on 5 January, they had conducted a series of ‘presumptive tests’, looking for the presence of toxins. Most items tested came back negative – no evidence of poison. However, the result for a pestle and mortar was more interesting, indicating the possibility that ricin might be present. Once back at the Porton Down laboratory, the scientists carried out a battery of further tests – all of which came back negative. Thus, just two days after the dramatic police raid – and the day before news of the ricin find made the headlines – it had been established definitively that no poison had been found. The media were in good company in having been misled. Soon after the raid, Home Secretary David Blunkett and Health Secretary John Reid issued a joint statement claiming ‘traces of ricin’ and enough castor oil beans to make ‘one lethal dose’ had been discovered. Prime minister Tony Blair said it ‘shows this danger is present and real and with us now’. A few weeks later, in February, the US Secretary of State, Colin Powell, weighed in. In a speech to the UN Security Council seeking its support for war on Iraq, he cited the London ricin find as evidence of the ‘sinister nexus’ between Al-Qaeda and Saddam Hussein’s regime. It has never been explained how the initial false positive result came to be passed on to the media as fact. Nor is it clear why (despite the lurid news coverage generated), it took Porton Down a further thee months to tell the police or government that there was no ricin, after all. The public and the media had to wait another two years to find out the truth, when it finally emerged in evidence at the Old Bailey trial that there never had been any ricin – and nor was there any plot. After a seven month trial, costing an estimated £20m, four of the five Algerian men who had been accused of plotting a campaign or poisoning and explosives, were acquitted. The fifth, who was already serving a life sentence for murdering a police officer, was convicted of conspiracy to cause a public nuisance. Whether the potent misconception that ricin had been found arose as a result of accident or design, it was certainly useful to politicians trying to drum up support for an unpopular war and trying to curtail civil liberties in the fight against terrorism. In this, politicians were unwittingly aided by an unsceptical media, which preferred sensational headlines to searching questions. When the real picture emerged at the trial, the revelation that the media had been duped was barely covered. It’s arguable that the early claims that ricin had been found had a distorting effect on the response of the authorities, media and public to the case right from the start. In such a heightened atmosphere, it was far more difficult to take a measured and objective view about what the finds at the flat actually signified. If it weren’t for these alarming false reports, it is entirely possible that the entire ricin plot trial would never have taken place.